It is the cross front tee from Ottobre 3/2004, the first issue I bought when I saw the awesome boy patterns they had. My oldest was only 4 at the time. The smallest size for this pattern is 62 and it's still pretty big on my girl but that's ok. The pants here are from Ottobre 4/2004, a great basics and costumes issue. I made size 56; baby's got short legs and these are still plenty big on her. She's in size 80. 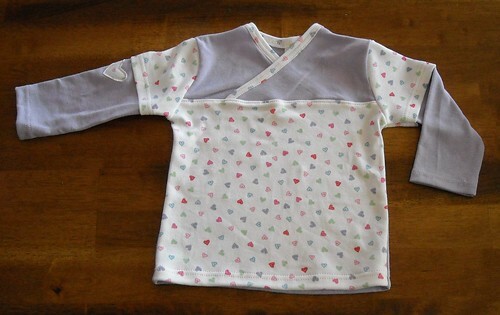 I got a kick out of making those double layer sleeves. And the appliques, too. I have been reading some Kaffe Fassett books from the library and getting some inspiration. 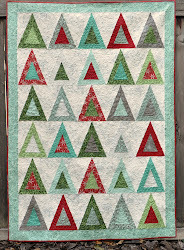 I am thinking of using my stack of reds and blues to make some other types of blocks to go with the churn dashes I've finished and make some kind of sampler-y type quilt. I'm going to need more reds. 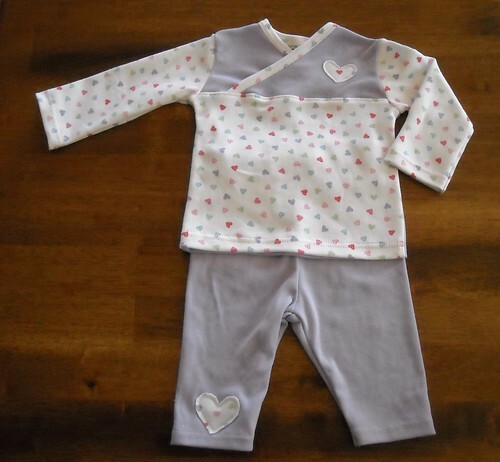 There are at least 3 springy baby dresses that I want to make. And I bought 3 Simplicity patterns at the sale yesterday for making skirts and tops for myself. Too bad I left my coupons at home. I'm still not used to all the prep and stress that goes into doing an outing with 3 kids.